Do your jokes begin something like So, a guy walks into a bar . . . or A priest, a minister, and a rabbi . . ? Tired of the same-old formulaic humor and worn-out riddles? Well, you re in luck. 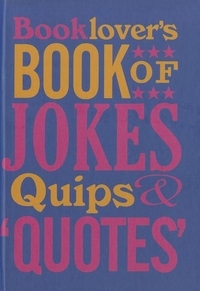 "The Booklover s Book of Jokes, Quips and Quotes "spans centuries to provide a collection chock-full of bookish humor, pithy sayings, one-liners, and just plain silly thoughts. With sections from some of the masters of witty writing, including the best barbs from Oscar Wilde; insults from Shakespeare; and wise words from Jane Austen, John Milton, and P. G. Wodehouse, this jovial little book is a cornucopia of delight and light relief for literary lovers everywhere.The jokes range from the erudite to the puerile and are sure to entertain and, in the right hands, might even turn a bookish sort into the life of the party."